If you are troubled, dear friend, take heart. Jesus tells us to take heart. In times of trouble, in times of extreme stress and pressure; in times of crisis, in times of difficulties and sufferings, this is a good verse to cast your eyes upon, and to meditate on and to memorise and store in case you need it the next time you are in some kind of trouble. In this study, we will examine how this verse can be comforted and still have peace even in bad times. so that in me you may have peace – In God we can have peace, a peace beyond human understanding [Phil 4:7|Article], a peace that cannot be found in the world or in anybody else. In this world there is no peace like this, and the world can neither give us such peace, nor take away the peace of God that is in us. Jesus has told us in advance, and when we know who our Lord is, when we know what is coming and when we are prepared for what is coming, we can have peace even if we are suffering. Peace I leave with you; my peace I give you. I do not give to you as the world gives. Do not let your hearts be troubled and do not be afraid [John 14:27]. This is a peace that covers our fears and troubles. In this world you will have trouble – Jesus said it, Paul and Barnabas said it: “We must go through many hardships to enter the kingdom of God” [Acts 14:22], Peter said it too, do not be surprised at the fiery ordeal that has come on you to test you, as though something strange were happening to you [1 Peter 4:12|Article], amongst other verses. Yet even though it’s not an uncommon teaching, we are often surprised when we face trouble, as if we were not told in advance that trouble, ordeals, suffering and trials will come our way. We may not know what kind of suffering exactly. We may not know the exact type of pain. But we cannot pretend not to know that the path of following Christ is an arduous road. But take heart! I have overcome the world – is there anything more comforting than this? 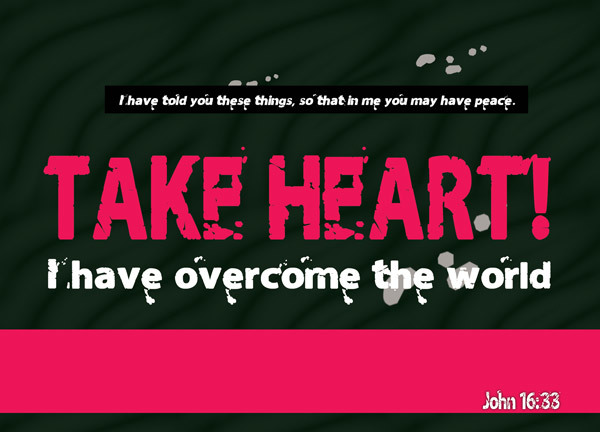 Jesus said, ‘take heart!’ When you’re having trouble, take heart, because he had overcome the world. It’s like a little child falling down and hurting his knee, breaking out into tears, and suddenly Mummy appears out of nowhere and says, ‘it’s okay, darling, Mummy’s here.’ We don’t really know why it’s okay, but we know it’s okay. We’re safe. Mummy will stop the bleeding. Mummy will hold our hand and make sure we won’t fall a second time. Mummy is here, and just Mummy’s presence alone, we can be comforted. Jesus said “I have overcome the world” – we know what it means, but we don’t quite know what it means too – it’s too big a concept for us to fully comprehend at times, especially in little moments of panic and pain. But even so, we can be comforted, because we have been told in advance of who our Lord is. We have been told in advance that we can find peace in the Lord. We have been told in advance that trouble and suffering will surely come. And we have been told in advance that despite our pains and troubles, Christ has overcome the world – Victory will be the Lord’s. Jesus has overcome the world. If God is for us, who can be against us [Rom 8:31|Article], then? And so, even if trouble is upon us, or even if we are in a time of suffering, we can have peace in the Lord. Even if the going gets tough, we can take heart, because we already know that victory will ultimately be claimed by God. Need peace in this chaotic world. Read Zecqi’s blog about Jesus’ words of encouragement.